Linking art, design and industry, our exhibition explores a rich heritage, new work and insights into contemporary materials and manufacturing at home and abroad. Five Storybooks, printed on linen paper, are available to read at our exhibition stations: Our Featured Designers: Linen Journeys in Design, European Unions, Art & Acquisition, Plant & Production and Supply & Sustainability. Our Exhibition Design is in collaboration with artist Nick Sargent. 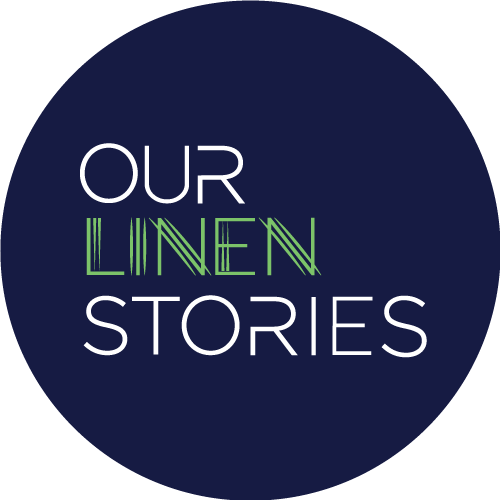 Our Linen Storybooks are created in collaboration with Alison Newman of PULP. We are honoured to present new work by Linda Green, internationally respected textile artist, representing the beginning of her response to an extensive period of research into linen. We lead our exhibition with 12 contemporary designs that utilise linen and innovative flax composites to tell stories drawn from Scotland, Ireland and The Netherlands. Scotland is home to many Design talents across disciplines from applied arts to manufacture. As part of a global ‘brand’, Scotland links with Europe and the world through its creativity, making skills, quality and innovation. Flax and Linen have a part to play in these exchanges: crafting, sharing knowledge, generating income and strengthening cultural bonds.